Tuhin Sanyal, Asst. Prof. in English, Tufanganj College, Cooch Behar, W.B. In popular belief, ‘Mysticism’ is ‘unifying with God or the absolute,’ or even unifying with the ecstatic or the altered state of consciousness. It is often given a religious or spiritual meaning vide epiphanies or revelations and inspired interpretations of the world-order and other mumbo-jumbo in relation to the Godly. But definitions change; and the mannerisms of exacting ideas and definitions, in relation to contemporariness, egg on the Human Being to search for a New Expression for Old Clichés — coherent and topical with his times. From this dialectical pattern, the new poet who is born after the death of God, starts legislating. Where the Godly ends, his Poetry begins. Devoid of the Godly authority, his legislations become the harbingers of expressions that are blinding paradoxes for innovative introspection. In that vein, the problem in relation to Mysticism and mystical experience created terrorizing tremors in the Richter Scale of human psyche ever since the death of God, and birth of Blake. Nietzsche furthered the truth about God’s death all the more with his path-breaking theories of annihilation—psychological theories, backed by the pseudo-scientific (logical-rhetorical-metaphorical) plausibility of existentialism, theories of all gods in fortuitous circumstances, and their resultant deaths accruing thereof. In such Godless times, the Romantic Blake automatically became foregrounded as the messiah or poet-prophet since he could refer to the attainment of insight in ultimate or intuitive hidden truths, and to human transformation supported by the paradoxical commonality of human experiences. I am not too much of a God-fearing man; to me God is not (m)aligned with orthodox Religion, Cult or Order, but to me ‘god’ is a way of life, ‘religion’ is anything pertaining to Humanity, and ‘cult’ is sheer Practice of the commune. And to me, all of that amount to Poetry. I am an avid reader of good poems (Pray, do not dub me value-judgmental yet! ), I try my hand at writing good verses (I too am an ‘unacknowledged legislator!’), and I am always on the lookout for new books of verses that may appeal to my mind and body alike (Pray, also do not dub me a sensual, pseudo-intellectual!). The other day, while traversing and tripping through the ‘virtual’ world and its pseudo-poetic drudgery, I suddenly was able to lay my hands (not feet, since I knelt down to pick it up the moment it saw it!) on a book of ‘real’ poetry. The poet had three ‘I’s (read ‘eyes’) in his first name — K-I-R-I-T-I — Kiriti Sengupta! Two eyes are always fine; but I felt inquisitive to know if the poet truly had his third-‘I/eye’ in place, and whether he could see the Discordiaconcors of the world-(dis)orders with that Instrument of Intuition and Intention which creates a poet. Thankfully the justified ‘I/eye’-conscious in his poems did not dishearten me! It seemed to me that much of the book was meant ‘to conceal’ than reveal flat and point-blank natural, liturgical, spiritual, and contemplative dimensions of the human cravings from poetry. It had its own crypts and cryptic codes. On making a careful scrutiny of the initial pages, I found that the poet with three ‘eyes/I’s—KIRITI—had quite audaciously dedicated the book to William Blake. Audacity? Not really! Such audacity is quite just when his poetic intuition is able to ken the “Gateway to God” (Pp.25) and yet “continue to live being frightened,” sustain life somehow, much like Rintrah in Blake’s “The Marriage of Heaven and Hell.” Ironically, and yet keeping in sync with the foregone discussion, in a queer Blake-ian pattern Kiriti upholds his range of religio-rational beliefs and ideologies, related to the extraordinary experiences and states of his individual moral code, which prompt him to “Keep An Eye” (Pp.15), “the third one” in particular, “over the ages” about which “sculptors never (actually) bothered”. Unwittingly perhaps, the poet reiterates Blake’s vision of the brooding abyss of the Universe dominated by Urizen (I decode the crypt as ‘Your Reason’) who keeps vigil on the ‘contraries’ that lead to ‘progression’— a progression through contraries, which other poets and sculptors, except Blake, could not conceive of. Interestingly enough, Blake was a sculptor himself and he chiseled the first manuscript of Songs of Innocence with his own hand, much as a collage of glue-papyrus-metals, adding natural dyes as colors, to give it the shape of a book of apparently simplistic rhymes, which would later be telling upon the much dogmatic Christian religious order of the times. The cliché of world’s experiment with the “earthly eyes” of Durga (name of a Mother-Goddess of the Hindu pantheon), negates a sacrament in the superimposition of a living human non-entity (a sundry woman by the same name) and the lifeless Godly entity by the very appellation. To add to this, such experiment is thoughtless, audacious, marginalizing, as well as pathetic in terms of the indifference of creative artists. Kiriti challenges the hollow, pseudo-religious throe in dogmas (here, ‘experimenting’ is one such), just as Blake had challenged Swedenborg. But Kiriti chooses to express with a postmodernist’s insight, from his Indian ethos, though in a clear parallel with Blake’s displaced Jehovah and Christ as the ‘Son of God’ (not God Himself) — an oblique fling of the dogmatic Christian pantheon. The poet of The Earthen Flute pipes to his readers very simple (though seemingly problematized), earthly—hence factual—ditties just as Blake would by juxtaposing ‘innocence’ and ‘experience’. Kiriti, like Blake, too believes in the reinstatement of contraries of good and evil side by side, since that is the inevitable actuality; and he has his “Clues to Name” (Pp.31-32). In this new world order of C.2016, he makes a clean breast of “Lust reinstated… inevitable it is…” which undergoes “Immersion via the mirror… (and bids) goodbye to the goddess”, notably, with a small ‘g’. In an accepted (Hindu) ritualistic bid the Goddess Durga, as in Kiriti’s poem, is first immersed in the liquid haze of a mirror (symbolic of water or River Ganga); lust of the male gaze is already reinstated therein, but is hinted at as if through cryptic language, until the post-consummation final ‘goodbye’ is bid to the ‘goddess’, only too fit for earthly consummation—a ‘goddess’ (diva?) with a real body to forebode issues of gender. In “The Marriage of Heaven and Hell” Blake visualizes the The Holy Bible on the library shelf of ‘The Devil’. God, for Blake, is Urizen (‘your reason’ with an imperfect ‘U’ lacking closure) and, to some extent, Jehovah, who can also be malevolent. Kiriti re-does a Blake’s in the same throe which amalgamates reason and ‘practiced’ religion in its fold, but with a difference. He does not sound prophetic, and his poems are not sermons. In a way, Kiriti speaks of a natural religion that is Man! 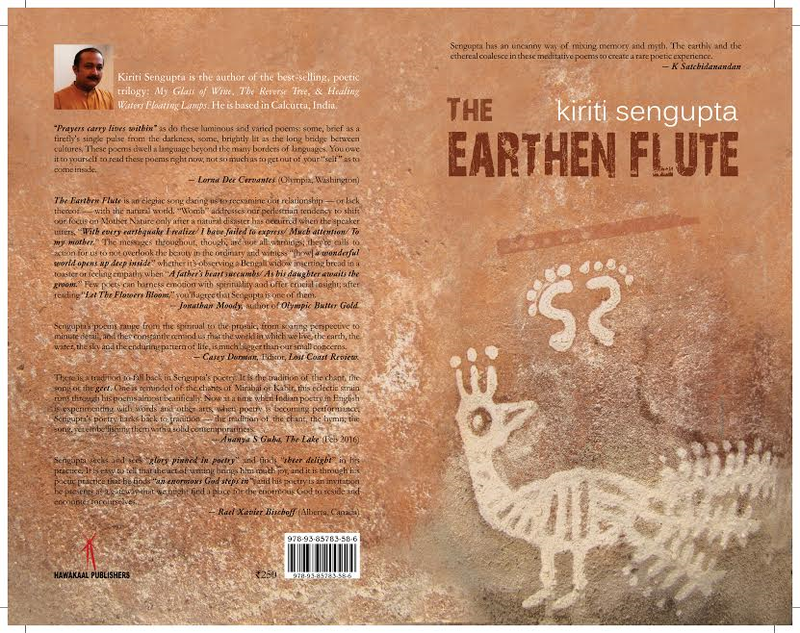 “Mother Water” (Pp.51) recurs in the “Nucleus” (Pp.42) of Kiriti’s poetry, and he adds ripples to it with the vibes of The Earthen Flute. “Ganga has her stories to tell… (she) listens to our prayers / Both mute and loud.” The queer ‘flux’ of ‘opposites’ wrench his expressions out from a poetic ‘fixity’ which is his own. Sometimes they are ace ironies in themselves; just as the “Womb,” for him, is akin to and reminiscent of the archetypal “earthquake.” He is religio-rational, just like Blake’s first person narrator Rintrah, thinking aloud while visit to Hell is still on. Hell is not seen as a place of punishment, which is obviously the common association to it, but it is seen as a source of unrepressed feelings, creative energy, and personal-spiritual progression. Similarly, Kiriti’s womb — earthquake (birth — devastation) equation is an opposing and oblique, as well as a regulated and authoritarian perception of heaven-in-hell and hell-in-heaven, as if in a Blakeian bid to reiterate Milton’s and Dante’s thoughts in their great works. 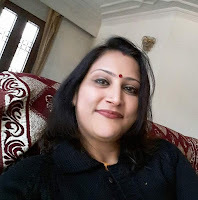 With this, Kiriti becomes a serious dissenter, who is permanently searching for a neo-modern, neo-mystic and neo-spiritual, practicable poetic truth by marrying off the contraries or the opposites. 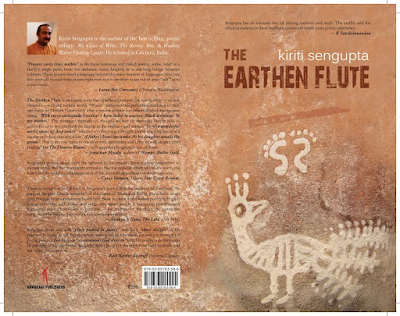 His The Earthen Flute, apparently a title with a low-key note, basks in the pathos of burning water (much like a romantic oxymoron) where “No ash is formed.” It gives its readers beauty, reminds them of some faraway music, the smell of the rain drenched earth, first love, the empty eve of Durga Dashami (after Goddess Durga is immersed in the river), a sexual aftermath, “gathering swallows twitter(ing) in the skies,” or, say, a “sunny pleasure dome with caves of ice,” but with a postmodernist’s expression. 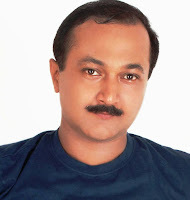 Bio-note:Tuhin Sanyal is an Assistant Professor in English at Tufanganj College in Cooch-Behar, West Bengal. Apart from an academic award from Berhampore University (Odisha) and the numerous academic papers and critical writings to his credit, he has penned three books of poems titled White, Blue and Other Poems (2004) archived in the National Library, Phoenix on a Female Body and Other Poems (2009), both published by Writers Workshop, Calcutta, and The Nectar-Nook (2016), which is an English rendering of Harivanshrai Bachchan’s Madhushala, published by Chitrangi, Kolkata.